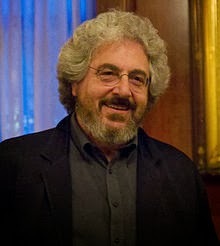 Sadly, Harold Ramis passed away yesterday at the early age of 69. Famous for so many great movies including Ghostbusters, Groundhog Day, Caddyshack, National Lampoon's Animal House, Analyze This, National Lampoon's Vacation and Stripes. Ramis also acted and appeared in such films as Knocked Up, As Good As It Gets, Airheads and Walk Hard: The Dewey Cox Story (where he played L'chaim). For many, Harold Ramis' finest writing contribution was the 1993 classic Groundhog Day. In a talk at the Hudson Union Society in 2009, Ramis explained some of the allure behind Groundhog Day. While Zen Buddhists find it to be very Buddhist, Christians see the Christian metaphors in the film. The psychiatric community told Ramis that they thought the movie was a metaphor for psychoanalysis. At the 2:39 mark of this talk, Harold Ramis shares how there is a connection between Groundhog Day and the Torah. As a Jew, Ramis explains that Jews respond to the movie so well because the Torah is read anew every year and yet we see the same story with different meanings. Since its debut a decade ago, the film has become a curious favorite of religious leaders of many faiths, who all see in "Groundhog Day" a reflection of their own spiritual messages. Curators of the series, polling some 35 critics in the literary, religious and film worlds to suggest films with religious interpretations, found that "Groundhog Day" came up so many times that there was actually a squabble over who would write about it in the retrospective's catalog. Harold Ramis, the director of the film and one of its writers, said last week that since it came out he has heard from Jesuit priests, rabbis and Buddhists, and that the letters keep coming. "At first I would get mail saying, 'Oh, you must be a Christian, because the movie so beautifully expresses Christian belief,' " Mr. Ramis said during a conversation on his mobile phone as he was walking the streets of Los Angeles. "Then rabbis started calling from all over, saying they were preaching the film as their next sermon. And the Buddhists! Well, I knew they loved it, because my mother-in-law has lived in a Buddhist meditation center for 30 years and my wife lived there for 5 years." In the movie, which enjoys its own seemingly endless cycle of rebirth on cable television, the character played by Mr. Murray is in Punxsutawney, Pa., covering Groundhog Day, Feb. 2, for the fourth year in a row. Frustrated because his career is stalled and by the fact that he can't seduce his producer, played by Andie MacDowell, he sees his assignment — waiting for a groundhog (or a rat, as Mr. Murray's character calls it) to see if there will be six more weeks of winter — as the final indignity. But it isn't quite. The next day he awakens in the same bed in the same bed-and-breakfast, to the sound of the same tinny clock radio with Sonny and Cher singing "I Got You Babe" and the babblings of the frighteningly cheerful local D.J., to discover that it is Feb. 2 again. At first, he uses the repetition to his advantage — he learns French poetry, for example, as part of his scheme to seduce the producer. Then he realizes that he is doomed to spend eternity locked in the same place, seeing the same people do the same things every day. It is not until he accepts his fate and sets about helping people (saving a homeless man from freezing to death, for example) that he is released from the eternal cycle of repetition. Of course, this being an American film, he not only attains spiritual release but also gets the producer into bed. Angela Zito, a co-director of the Center for Religion and Media at New York University, screens the film for students in her Buddhism class. She said that "Groundhog Day" perfectly illustrates the Buddhist notion of samsara, the continuing cycle of rebirth that Buddhists regard as suffering that humans must try to escape (a belief, Dr. Zito noted, that was missed by executives at Guerlain, who, searching for an exotic name, introduced a perfume called Samsara in the 1980's, overlooking the negative connotations). "Groundhog Day," Dr. Zito said, is a cinematic version of the teachings in Mahayana Buddhism, known as "the greater vehicle." "In Mahayana," she said, "nobody ever imagines they are going to escape samsara until everybody else does. That is why you have bodhisattvas, who reach the brink of nirvana, and stop and come back and save the rest of us. Bill Murray is the bodhisattva. He is not going to abandon the world. On the contrary, he is released back into the world to save it." Wow. So can anyone (a newspaper reporter?) be a bodhisattva? "I would call that a Napoleon complex," Dr. Zito said with a sniff. "There is only one bodhisattva, and that is the Dalai Lama." Some theologians see much less Buddhism in the story than Judaism. Dr. Niles Goldstein, rabbi of the New Shul congregation in Greenwich Village and author of "Lost Souls: Finding Hope in the Heart of Darkness" (Bell Tower, 2002), said he finds Jewish resonance in the fact that Mr. Murray's character is rewarded by being returned to earth to perform more mitzvahs — good deeds — rather than gaining a place in heaven, which is the Christian reward, or achieving nirvana, the Buddhist reward. He has not used the movie as an allegory for his congregation, he said, but he might now. "The movie tells us, as Judaism does, that the work doesn't end until the world has been perfected," Rabbi Goldstein said. But wait. Michael Bronski, a film critic for The Forward who teaches a course in Jewish film history at Dartmouth, said he sees strong elements of not only Jewish but also Christian theology. "The groundhog is clearly the resurrected Christ, the ever hopeful renewal of life at springtime, at a time of pagan-Christian holidays," he said, adding: "And when I say that the groundhog is Jesus, I say that with great respect." The Rev. James Martin, a Jesuit priest and an associate editor of America, the National Catholic Weekly, didn't quite see the groundhog as Christ-like. Referring to the Murray character, he said, "You do, however, very clearly see the deadness of his life at the beginning of the movie." After the self dies, he added, "what is reborn is this new person resurrected from his comatose way of looking at the world." Mr. Ramis, who was raised Jewish, said he feels like a Buddhist, but does not practice any religion. "Although I am wearing meditation beads on my wrist," he said. "But that's because I'm on a Buddhist diet. They're supposed to remind me not to eat, but actually just get in the way when I'm cutting my steak." The connection between Judaism and Buddhism, he said, is a strong one, adding that many Buddhists in the United States started out as Jews. "There is a remarkable correspondence of philosophies and even style between the two," he said. Yogis, Jesuits and psychoanalytic practitioners have told Mr. Ramis that they feel a strong spiritual kinship with the message they see in the film. In the case of the psychoanalysts, he said, "it's the `we keep reliving the same old patterns over and over again until we gain the right to free ourselves' thing." And in Washington, a branch of the Chinese spiritual movement Falun Dafa, also known as Falun Gong, has used the movie to instruct members in its belief that the spiritual self is not allowed to move to higher levels until it learns from past mistakes. (Dr. Zito said that makes sense, because Falun Gong draws many beliefs from Buddhism.) Some Wiccans also point to the film as particularly important to their beliefs, because Groundhog Day — the day itself — is one of the four "greater sabbats" that divide the year at the midpoints between the solstices and equinoxes. Several Web sites devoted to Wicca call the movie required viewing. "No one comes down and issues this formal command, and so he doesn't know, and the audience doesn't know, why this day is repeating, but it is," Mr. Prendergast said. "And that's why it is appealing to so many different religions. He faces this existential test, but he does not know it's a test, and he doesn't know what the results will be." No matter what, if any, religious metaphors, are to be found in Groundhog Day, the fact remains that the entertainment industry lost an icon yesterday. Harold Ramis was a screenwriting maestro and his movies will endure for generations. May the memory of Harold Ramis be for blessings.